It's Like Taking Care Of A Baby! The best advice for watering new grass seed is both simple and complicated. You only get one chance to germinate seeds correctly. Not enough water will kill the sprout. Too much water can leave less than ideal results. The simple word is to keep it moist all the time. 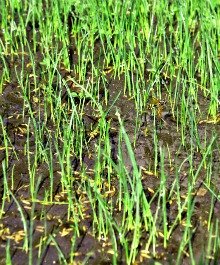 That can prove to be a complicated demand because of the numerous factors that make every grass growing situation unique. Let’s discuss your basic goal, what it will take to achieve it, what problems can develop, and how to solve them. Just throw a ton of water on it? Is that all a new lawn planting needs? It's time to be smart. The simple lawn sprinkler in this photo can pour out a lot of water. That may be your worst enemy. soft sinking soil leaves a trail of footprints across the lawn. So go easy with the volume of water you put down. But don't be skimpy either. Plan to find a good balance of amount and frequency that fits your soil and weather conditions. All seeds require moisture and a certain temperature range before they begin to germinate. Once the germination process has begun, if conditions change, the seed or new sprout is vulnerable and can die. If the seed or sprout dries out --- it dies out. Your mission then, is to provide adequate moisture at all times. The phase before you seen any sprouts poking out is most critical. Your commitment to watering new grass seed must stay strong. The germination time for grass seed ranges from 5 to 30 days depending on the variety. It can be even longer than this in cooler temperatures. This is how long it will take to actually see the grass growing. Until this point, the seed, or the soil and mulch in contact with the seed, must stay moist. It doesn’t need to be soggy or swimming, but moist. Once the new grass is visible, the roots are also growing down into the soil. This happens quite quickly. As soil moisture below ground is more accessible to the roots, the plant is not so vulnerable now. However, don’t reduce the amount of watering on new grass seeds yet. Seeds will not sprout all at the same time. Seeds will be buried at different depths, absorb water differently, or be of different quality or maturity. Many seed mixtures are blends of multiple varieties that will have different characteristics affecting their development. It is important to keep the surface area constantly moist until all seeds have germinated. Until the planted area is densely showing green growth, don’t allow it to dry out. The percentage of seed germination is in your control, though people often blame a thin lawn on the “lousy seed that didn’t come up!" It is possible to increase the percentage of germinating seeds. Learn more in the article Grass Seed Germination. 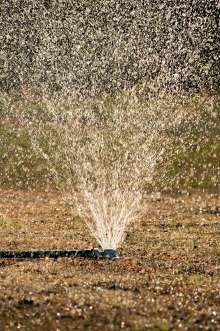 Watering New Grass Seed: How Much? Sun and wind can dry out the soil surface. Trees, shrubs, buildings and clouds can shade some areas, but not others. Lawn grasses being over-seeded may provide shade to new seeds in an inconsistent manner. These factors make it difficult to determine a single watering amount needed for an entire area for each day it is required. Consider how the requirements for watering new grass seed can be altered for each of the following circumstances. 1. An existing lawn being over-seeded. Normally a lawn should be watered deeply but infrequently. NOT NOW! Change this when you are watering for new grass seed. Now you must water everyday. Set automatic timers for about 5 to10 minutes, early in the morning, and again at mid-day. Observe and adjust the amount of time. Sprinklers have a broad range of flow in gallons-per-minute and you must use your judgment here. Watering done by hand or hose-end sprinklers must be consistently and evenly applied. It should provide approximately the same amount of moisture throughout, but less in shady areas. Twice daily watering is essential until the new grass is up, then after one more week, reduce to once per day. Adjust this pattern according to season and temperature demands. 2. Bare lawn areas being patched. If a lawn area is of substantial size or you have multiple areas, follow the same instructions as above. For smaller amounts or areas, if hand watering is practical, leave the lawn on its normal irrigation schedule for a single cycle each day. Supplement the bare areas once or twice daily, or as needed, to keep the new seed moist. 3. New lawn areas sowed with grass seed. New lawn preparation done properly will have tilled the soil to loosen the ground for the new grass plants. This loose soil is prone to holding large amounts of water. Do not over-water! Some soil types will get spongy. Walking on it in this condition will leave serious depressions and cause compaction. Trying to correct a yard full of deep footprints is not a chore you want to attempt. The top inch of soil should stay moist at all times. This may take only 2-3 minutes or 5-6 minutes, or longer, depending on your sprinkler system and the soil type. Use your best judgment. Moist, but not soggy is the plan! As above, it should be repeated. 2 or even 3 times each day is appropriate if the weather is hot enough to require it. Watering new grass seed on new lawn areas does NOT require lengthy watering times. That simply sends the water deeper than it is needed at this early stage. Frequent watering is the only way to keep adequate surface moisture. But that does not mean go crazy, as this photo shows, and the next section will explain. Run-off and seed movement on sloping ground. It may be necessary to reduce the watering time and repeat more frequently. A mulch over the seed should help reduce seed movement in addition to reducing evaporation. Over-watering that leaves the soil soggy and spongy. It can take a long time for some soils to dry out. Clay or adobe soil is the worst. Stay off of them if this happens. Over-watering areas that are shaded and need less water while sunny areas need more water. (Usually a problem with automatic sprinkler systems.) If feasible, consider one cycle of automatic watering on the entire area, and a hand watering later, to cover just the more exposed areas as they dry out. Under-watering new grass seed, especially not often enough, due to any and all excuses. Remember, one mistake can mean you start all over again. Over-wet soil that does not allow water to soak down is bad. Seed may rot; algae may grow; oxygen for the roots is depleted. Reduce frequency or length of watering. Mulch that gets too dry clumps together. Grass sprouts may be held back or may push up a clump, possibly dislodging seeds just starting to grow. Avoid the hottest season or occasional heat-spells when planting. Watering new grass seed is enough of a challenge without taking on the heat as an enemy. If you have no choice, be vigilant and accept the need to apply water more frequently as it dries out more quickly. If you see moss or algae type growths showing up, especially in shady areas, there is too much moisture present. Reduce the frequency of watering and probably the length of time as well. For small patch projects, some seed brands are coated with a covering that holds moisture. This approach is effective, but may be too expensive to consider for a large area. Don’t buy a cheap lawn sprinkler. They do not evenly distribute the water. They often leak and cause puddles. You get what you pay for. Companies that research and test their products for effective coverage have to charge more. Oscillating sprinklers are good for watering new grass seed in large areas where run-off is a concern. The back and forth motion allows time for soaking in, rather than having a constant spray on all areas. The link at the page bottom is an article that addresses the common objection to oscillating sprinklers, that they stop working too often. The product link to the right has extra adjustments; pricey, but best for those who need the upgrade. Many of you can use the more basic models that will also be displayed. Remember that the long-term benefits far outweigh the trouble you go through while starting a lawn. 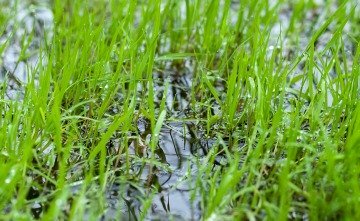 Watering new grass seed may be quite a nuisance, so be sure to get it right the first time! Visit our Lawn Care Home Page to see what other topics may assist you in creating, maintaining and enjoying a beautiful, healthy lawn. 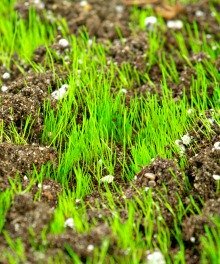 Go to Planting Grass for more articles about new grass. Go to Oscillating Sprinkler for tips on a preferred portable lawn sprinkler & how to keep it functional.